As soon as February starts everything around us is about Valentine’s Day! We, at Mar d’Estórias, think that talking about Valentine’s Day confines love stories to one day. If we think about it, love stories are lived every moment, every hour, everywhere. So, we searched for two experiences of different generations, that kept the core – love! The first story comes from a childhood coexistence and differences of opinion in high school. A story of the love of two people who met in elementary school and eventually chose to grow together in honesty and companionship – Tânia Viana (35) and João Grosso (36) will celebrate, on the 17th of July, 20 years together. Their childhood friendship, as neighbours and schoolmates, blossomed into dating during the summer holidays of 1999: “My mother had a coffee shop in Chinicato, and he lived two streets away,” says Tania. They say that “we had the advantage of having grown up together“, because they shared classes, nights out, adolescent problems and entering adulthood: “We were very close … but we were always fighting!”. The discussions between them were the basis which strengthened their love! By the way, these friends were nicknamed the “end of the world couple,” in high school, for having nothing in common with each another, proving each day that everyone was wrong. With Tânia going to University in Lisbon in 2001 and João joining the Navy in 2002, it was necessary to readjust what they had, relying on the strong feelings they had for each other: “It was very difficult! The first years of dating were marked by absences,” confesses Tanya. In 2008 they decided to marry: “We got married in the middle of a NATO mission. We had everything set for the wedding when that mission was issued. Since it was easier for him to ask for leave, João came for two days to get married!” And three years later they became parents to Leonor’s. The second couple is from an older generation, and are married for 58 years. 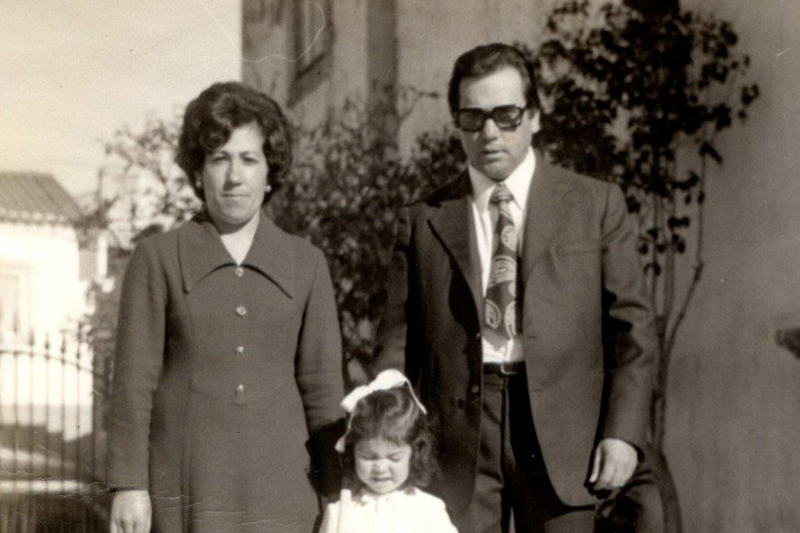 Deolinda Lamberto and Fernando Faustino share their love story which goes back to the late 50s. At a time when rice farming was one of the primary means of subsistence, Fernando met his future wife in a group of women who worked in the rice fields of Carriçal (on the way to Monte Clérigo Beach). Fernando, the foreman of this work group, didn’t rest until he conquered Deolinda: “we met on the day he went, on a tractor, to collect the monthly box of groceries, at my house. I didn’t think anything at the time. I didn’t even look at him properly. But from that day on he began to court me!” Conversations at lunchtime and friendliness at the balls were narrowing their connection. It was on Ascension Day, in the spring of 1959, that they exchanged their first kiss after a field trip with a group of friends. After the farewell parties of the end of the rice season, Deolinda returned home, but the contact remained! Fernando wrote love letters, addressed to a neighbour, “a girlfriend of mine who was in the rice fields with me; (…) the letters were sent in her name, but in fact they were for me,” says Deolinda. Ancient times dictated that love be more avowed than lived, so every letter was received with rapture and passion! Messages of love that were thrown away by order of Deolinda’s father, who prohibited the courtship of Deolinda for being very young and for Fernando being known as a flirt: “My father didn’t want us to date. Fernando already had many girlfriends, so the condition to date was to marry me.” Here, love spoke louder and they married on the 27th of November 1960, Deolinda wasn’t even 17 years old yet. Fernando’s perseverance gave this couple three children and countless experiences. They have built a family that now has two grandchildren and a great-grandson. There are 60 years of moments recorded in the memory of two people who continue to live the love of their youth. Recalling another period, Mar d’Estórias tries to awaken this love, through fragrances from that time. For a couple as Deolinda and Fernando, we selected Benamôr products (1925) – Face Cream (14 €) and Rose Amélie soap 100gr (6.50 €). For him, we suggest a brand present in his generation – (1918) Lavender Cologne 200ml (22 €) and Lavender Soap 125gr (2.90 €).